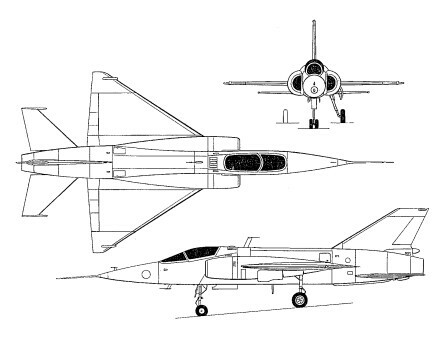 Originally conceived to meet a Spanish Ejercito del Aire requirement for a small M=1.5 interceptor and the design responsibility of a Germano-Spanish team supervised by Prof Willy Messerschmitt, the HA-300 programme was transferred to Egypt. Here development and construction was undertaken in Factory No 36 at Helwan, this being controlled by the Egyptian General Aero Organisation (EGAO). Originally designed for the proposed afterburning Orpheus BOr 12 turbojet, the HA-300 was modified for the Brandner-designed E-300 with a calculated afterburning rating of 4800kgp. The first V.1 prototype, powered by a 2200kgp Orpheus 703-S-10, was flown on 7 March 1964, a similarly-powered second V.2 prototype flying on 22 July 1965. The version flew supersonic. Egypt’s HA-300 was test flown in the Spring of 1964 by an Indian pilot, showing no appreciable advantages over the MiG-21. The definitive third prototype with the E-300 engine commenced taxi trials in November 1969, but the HA-300 programme was then terminated without flight testing of this prototype being undertaken. It was anticipated that the E-300-powered HA-300 would be capable of attaining 12000m and M=2.0 within 2.5 min of take-off. The Orpheus-powered prototypes achieved approx M=1.13 during flight test. The HA-300 V.1 is displyed in the Deutsches Museum – Oberschleissheim and the Ha-300 V.2 and V.3 remained in Cairo.